Stainless Steel K-Type Thermocouple Insertion Probe 6"
This is a great medium size insertion thermocouple with a K-Type sensor. The sensor is housed at the tip of a 6 inch long stainless steel probe, which comes with a 3 inch long handle. It has a miniature type connector that will work with digital K-type thermometers. I frequently have customers who buy this for measuring the temperature of molten lead in bullet casting, frequently with Lyman casting kits. The sensor is about 1/4 inch from the tip. The tip can be inserted about 1 inch into the molten lead to get you a good temperature reading. It is important to keep the handle and cable at room temperature. This is a small size and inexpensive insertion thermocouple with a K-Type sensor. 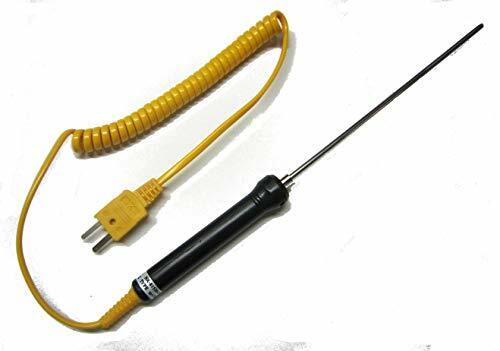 The sensor is housed at the tip of a 6 inch or 12 inch long stainless steel probe, which comes with a 2 inch long plastic handle. The yellow PVC plastic cable is 45 inches long. The handle needs to be kept at room temperature. The maximum rating is 752°F ( 400°C ) at the tip of the stainless steel part, with the handle at room temperature. It has a miniature type connector that will work with digital K-type thermometers. This probe can be inserted in liquids or any object you like to measure. It is much easier to clean than the thermocouple wire that comes with many thermometers. This is a small size and inexpensive insertion thermocouple with a K-Type sensor. The sensor is housed at the tip of a 3 inch long stainless steel probe, which comes with a 2 inch long plastic handle. The handle needs to be kept at room temperature. The maximum rating is 752°F ( 400°C ) at the tip of the stainless steel part, with the handle at room temperature. It has a miniature type connector that will work with digital K-type thermometers. This probe can be inserted in liquids or any object you like to measure. It is much easier to clean than the thermocouple wire that comes with many thermometers. 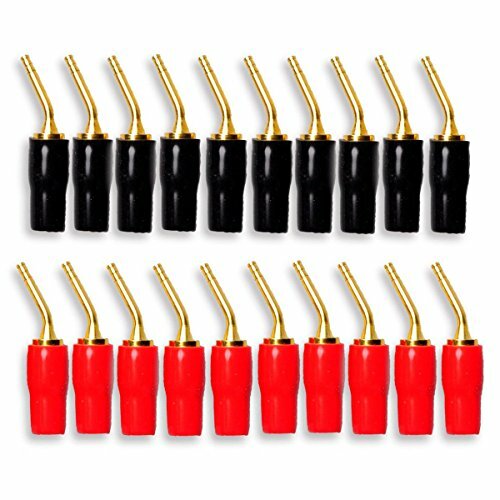 This is for a set of 2 of the thermocouples, you save $2 on the single price. 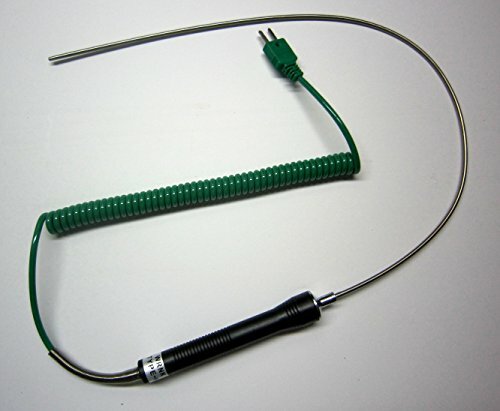 · Stainless steel probe, Spring Thermocouple K Type Probe. 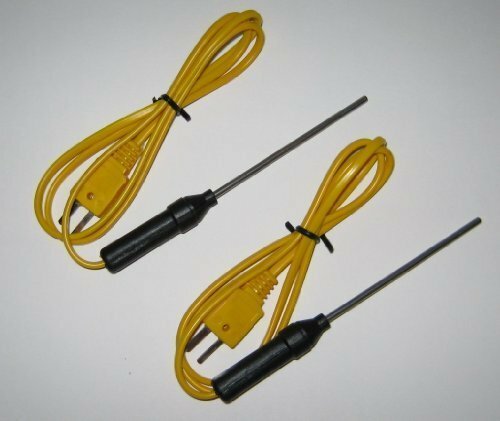 · This is a great and reliable insertion thermocouple with a K Type sensor. The K Type thermocouple sensor is housed at the tip of a 14cm long stainless steel probe, which comes with a small 1.7 inch long handle. It has a miniature type connector that will work with digital K-type thermometers. 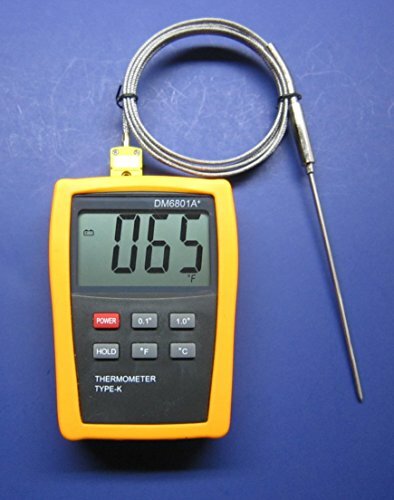 · This stainless steel thermocouple probe can be inserted in liquids or any object you like to measure. It is much easier to clean than the thermocouple wire that comes with many thermometers. The new spiral cable will keep your work area tidy. This is a great extra long size thermocouple with a K-Type sensor. The sensor is housed at the tip of a 19 inch long stainless steel probe, which comes with a 3 inch long handle. It has a miniature type connector that will work with digital K-type thermometers. This probe can be inserted in liquids or any object you like to measure. It is much easier to clean than the thermocouple wire that comes with many thermometers. It is used in the laboratory, for science projects and research, and in many engineering and industrial applications, e.g. casting lead, measuring melts, kilns, ovens and liquids. The stainless steel sensor is flexible and can be bent to the shape you need. It will ship in an U shape as shown, but you can bend it straight when you receive it. 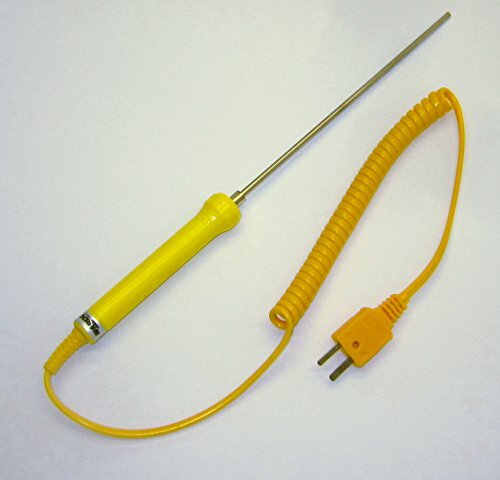 This is a medium length, durable insertion K-type thermocouple. The sensor is housed at the tip of a 6 inch (15 cm) long stainless steel probe. The diameter of the insertion probe is 3/32 inch or about 3 mm. 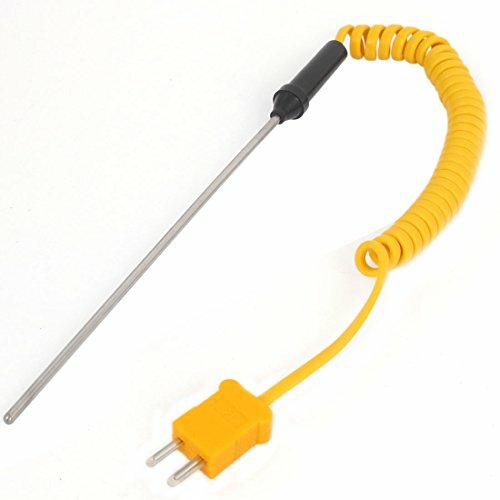 The K Type thermocouple comes with a 3 inch long yellow plastic handle, which must be kept at room temperature (maximum is 160 degree Fahrenheit for the handle). 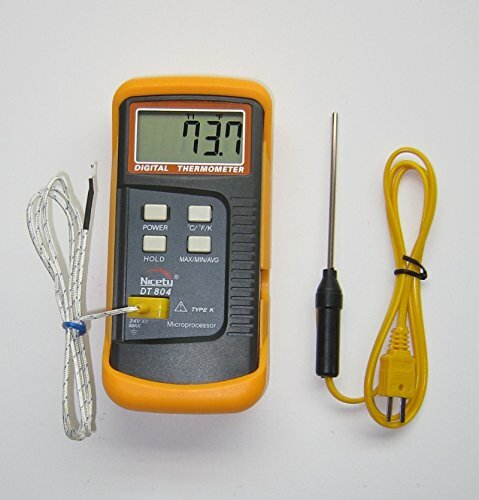 It has a miniature type connector that will work with a digital K-type thermometer from many manufacturers (Nicety, Extech, Amprobe, TPI, REED and others). This probe can be inserted in liquids or any object you like to measure. It is much easier to clean than the thermocouple wire that comes with many digital LCD k-type thermometers. It is used in the laboratory, for science projects and research, and in many engineering and industrial applications, e.g. casting lead, measuring melts and liquids. In the HVAC trade it can be used to measure the temperature in ducts, the temperature of water and exhaust air, and of boilers. Home brewers use it to test for the correct temperature. 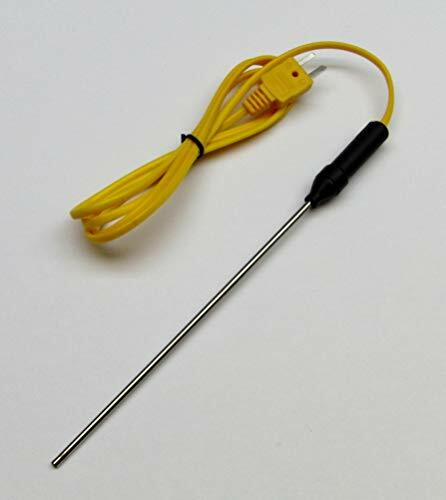 Important: The temperature rating is for the tip of the probe, the handle and the cable are plastic and must be kept at room temperature during the measurement, they will otherwise melt. Shopping Results for "Insertion Probe Type"